Gewurztraminer grapes -- Andlau, Alsace, 1 September 2017. Gewurztraminer is a fairly flashy white grape grown predominantly in France (especially Alsace), Germany, the U.S., Australia, and New Zealand, especially in pockets where the climate leans to the cooler side and the flavors have an opportunity to concentrate. A lesser-known white wine in terms of plantings and availability, but for those that have experienced the snazzy aromatics and full-on flavors of Gewurztraminer, they tend to be fast fans. Typically, the best Gewurztraminer wines may be found in Alsace and Germany. "Gewurz," meaning spice in German, gives the tell-tale aromatic clues as to what to expect from the nose of this zesty white wine. 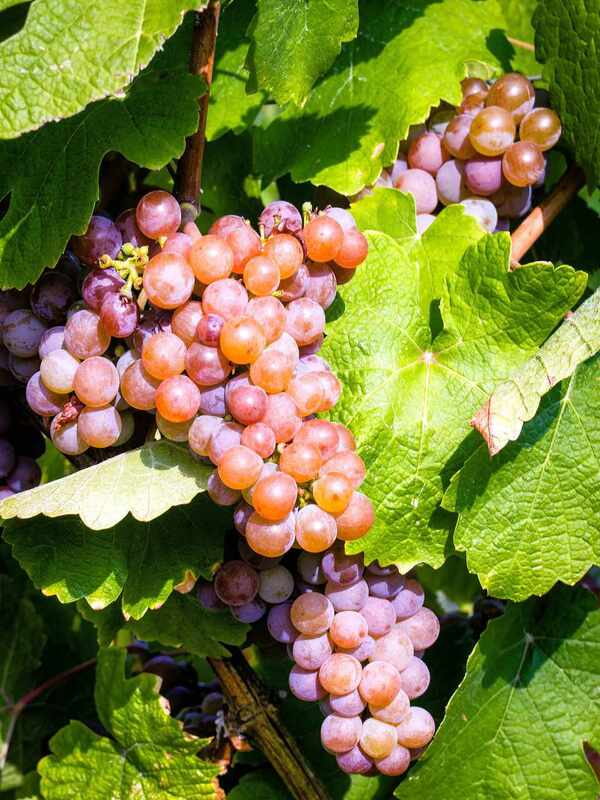 The Gewurztraminer grape itself grows best in cooler climates and leans towards pink in color. The wine takes this richer colored grape skin and turns it into deeper golden colored wine. It Starts with Scent: Lychees. This classic, tell-tale aroma is Gewurztraminer's trademark scent, the secret smell that is a dead giveaway in a blind tasting. It's worth the price of a can to become familiar with the sweet smell of lychee. Smokey notes, rose petals, grapefruit and the richer character of pineapple may all make their way into the well-woven aromatics of a great bottle of Gewurztraminer. Why Acid Rocks: Acidity is another key character in the story of Gewurztraminer. The best Gewurztraminers carry higher levels of food-friendly acidity, giving the wine a lively, fresh nature. Cooler climates lean into the acid profile more than warm weather regions. Lower levels of acidity can leave Gewurztraminer flabby on the palate, holding little interest and pairing potential. Gewurztraminer is often made in a dry to off-dry style, though the dynamic aromatics and fuller mouthfeel can give a palate impression of sweetness. While Gewurztraminer may show a dry or sweet style, the sweeter themes tend to partner best with dishes that carry a little heat. The slight sweet will tame the heat and the acidity will offer considerable pairing versatility. These wines pair remarkably well with Thai or Asian dishes, as well as zesty-flavored fares like barbecue or hot wings. The flavor and aromas often include rose, pear, citrus, spice, and mineral. Gewurztraminer shows best when served well chilled. Shoot for 40 to 45 F. Not built to age well, drink Gewurztraminer sooner rather than later upon release.